Hip Hop music star Christopher Wallace, better known as Biggie Smalls or The Notorious B.I.G., was part of an East Coast-West Coast rapper rivalry that included Tupac Shakur and Sean “P. Diddy” Combs. A year after Shakur was murdered, Notorious B.I.G. was preparing to release his second album when he was gunned down at the age of 24 as he left a party in Los Angeles. The album soared to #1 on the charts posthumously. Notorious B.I.G. is ranked as one of the top rappers of all time. Christopher Wallace was born in New York on May 21, 1972. His mother Voletta Wallace was a Jamaican pre-school teacher. His father Selwyn Latore was a welder and a politician. Wallace’s father deserted his family leaving his mother to raise him in Brooklyn. Voletta Wallace worked two jobs to provide the income that allowed her son to attend private school as a child. Although Wallace was a good student, by the age of 12 he was dealing drugs and as a teen fell into a life of crime. He would be arrested numerous times during his short life. Eventually Wallace attended Brooklyn’s George Westinghouse High School, and after school he jammed with jazz saxophonist Donald Harrison. Wallace dropped out of high school at 17 with aspirations of becoming a rap superstar following his idols Run-DMC and Big Daddy Kane. Wallace initially adopted the stage name “Biggie Smalls” after a character in the 1975 movie Let’s Do It Again. Due to legal issues with the name, he later adopted a second stage name “The Notorious B.I.G.” In the 1990s Sean Combs, AKA "P. Diddy,” heard Biggie Smalls’ demo tape and quickly signed him with Uptown Records. In 1992 Combs put Smalls on the remix of Mary J. Blige’s song Real Love, giving the rapper his first national exposure. The following year Smalls’ debut single Party and Bulls**t was released. That same year Combs separated from Uptown Records to begin his own Record Label, Bad Boy Entertainment, and Wallace followed him under the name of Notorious B.I.G. On August 4, 1994 Notorious B.I.G. married R&B singer Faith Renée Evans. The following month his first album Ready to Die was released. The album included the hit singles Juicy, Big Poppa and One More Chance, and was so successful that in 1995 Billboard Music Awards named Notorious B.I.G. “Rap Artist of the Year” while his One More Chance became “Rap Single of the Year.” His success fueled the coastal rivalry with other prominent rappers, and when Tupac Shakur was murdered in 1996, Notorious B.I.G. was implicated by the Los Angeles Times. The paper later published a retraction. On the night of March 8, 1997, Notorious B.I.G. attended a large Las Vegas party promoting his new single Hypnotize and his new album. On the way back to the hotel from the party in the early morning of March 9, he and his entourage were attacked by unknown assailants. Notorious B.I.G. was killed by gunfire at the age of 24. 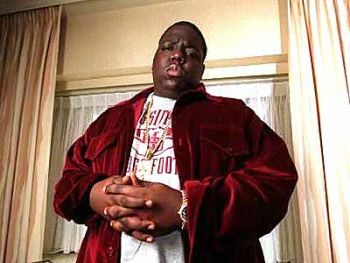 He left behind his wife Faith, his three-year-old daughter T’yanna and his five-month-old son Christopher Wallace, Jr.
On March 25, 1997 Notorious B.I.G.’s second album Life After Death was released posthumously. In 2000 the album was certified Diamond in sales, meaning that it sold more than 10,000,000 copies. Life After Death was one of the few albums in any genre to hold this distinction, making it one of the highest selling hip-hop albums of all time. Holly Lang, The Notorious B.I.G. : A Biography (Westport, CT: Greenwood, 2007); Mickey Hess, Icons of Hip Hop: an Encyclopedia of the Movement, Music, and Culture (Westport, CT: Greenwood, 2007), Steve Huey, The Notorious B.I.G.,” All Music Biography. Accessed May 13, 2011, http://www.allmusic.com/artist/p44889/biography); Pierre Perrone, “Obituary: Notorious B.I.G.,” The Independent, March 10, 1997.